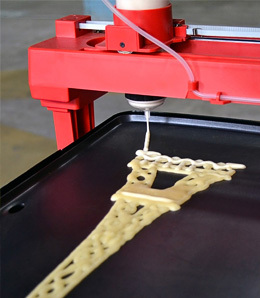 We know about 3D printing in regard to structures, and now 3D printing for food is on the rise. There are many benefits of 3D food – it allows chefs to deliver unprecedented control of flavor, color, texture, and nutritional content. This means especially creative and elaborate desserts and cakes are constructed; chefs are able to experiment with new edibles and have more artistic freedom in their dishes. Healthcare can also be improved, for example; printing foods allows for better control of texture and nutritional content, especially important for advanced aged patients who have difficulty chewing. And, ingredients can be tweaked – add B12, less sodium, substitute with an insect protein; plus it can have a positive environmental impact, offering an alternative to natural meat. However, humans as a species are meant to hunt, gather and prepare food together. Although the former is less common, cooking and sharing meals together is an important part of the human psyche. What would happen if we were to take that away? What’s more, human nutritional needs have been shaped and met by eating whole, natural foods. These contain trace elements, microbial flora and fauna we are continually discovering the significance of. This limited understanding means we may never be able to engineer a truly perfect food profile and brings with it a risk of specific deficiencies both of known and unknown substances. Research into the influence of intestinal flora has established links to conditions such as Parkinson’s, Alzheimer’s, depression and obesity. Probiotics have been successfully cultivated and administered for centuries now, but always in accompaniment with whole and raw food sources. If a large portion of diets were made up by 3D printing, the risk of unknown malnutrition may rise. There are a number of forces acting on the food industry and the role which technology will play. The prevailing forces, with the most scale and applicability, will impact the lives of humankind on a multiple-times-per-day basis. As technology advancements in 3D printed food and nutrition open up new and exciting doors for us, the ethical trade-offs and choices we need to make will become more complex too. The natural environment, humanist issues, nutritional risks and our very relationship with food are likely to change drastically as we play with the dynamics of this six million year relationship.